We feel we have the best adult amateur racing program in the United States! 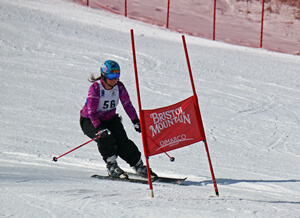 CMSC skiers and snowboarders compete against others of their own ability and gender (male and female boarders compete together) and are “promoted” as their skill level increases. That’s what sets us apart from other adult programs – we don’t use a handicap system. Our ski and snowboarder racers run the gamut from beginners to experts and master’s racers. And most importantly, we all have fun! Interested? Our qualifications are few. For your first race simply show up and sign a waiver, either at registration, 8 – 9am inside the lodge before the race, or from a race official at the top of the course during the race. Your first race is FREE and your result will be used to put you in a class with racers of like ability. After that you’ll need to join one of our member clubs (listed below) and register through their race chairman. Race fees are usually $12 – $15 per race, and some of the clubs pay them for you. Check with the club you wish to race for. Click the CLUB tab from the home page for more info about member clubs. Also all racers are required to help work occasionally on race days. Our skiers run slalom, giant slalom, super long giant slalom, and dual format. The courses are set on intermediate and advanced slopes, depending on your skill calss, and are very similar to what you see in the World Cup. How cool is that? Snowboarders run slalom and giant slalom courses. Races are scheduled most weekends in western New York and in Cleveland. 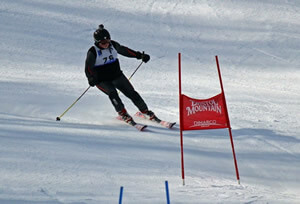 Participants can race in any or all races, earning points for themselves and their own ski club race teams. The crown jewel of our program is Combined Race Weekend, featuring a super long giant slalom and a giant slalom on Saturday, with a slalom held on Sunday. Racers compete for the coveted Individual Combined Trophy, and earn points for the Team Combined Trophy. 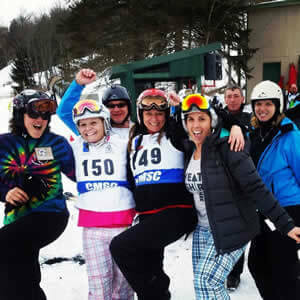 If your CMSC ski club does not have a race chair, email CMSC race chair, Becky Bertuzzi. If your CMSC ski club HAS a race chair, please contact them for details.